Kyle prom 07-08 had a little problem with the razor! Justin and his hang over! 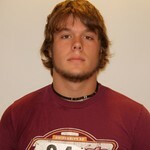 Kyle- All conference MVP Offense and MVP Defense football 2008-09 Senior on his way to play for Concordia College!